We want you to meet our new baby! THE NEWEST AND BEST LOW-PROFILE, NON-SKIDDING RUG PAD AVAILABLE. For use on all floor surfaces, laminates, tile, marble, wood and carpet. 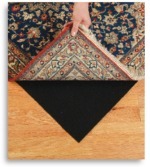 Especially good for controlling skidding and wrinkling of runners and scattered rugs. Creates a clean, low profile when thickness is an issue, such as antique rugs. Directions: For hard surface place rubber side down next to floor.